The most recent (above magnitude 2 for the past few hours, larger magnitudes for the rest of the past day, to limit the number to about 100 per day) are shown below with detail links for each quake. We use multiple data sources from all over the world (currently over 20 different national and international agencies), and prioritize them in the following descending order: national institutes / agencies - USGS - EMSC - GFZ. Where data from different agencies for the same earthquake is available, you can find and compare the often differing data for magnitude, depth etc. in the detail page for each quake. As a new feature, when updates are available, you will be notified to reload the page from the server (or use F5 key / Shift-Reload). You can also opt for the page to automatically update. 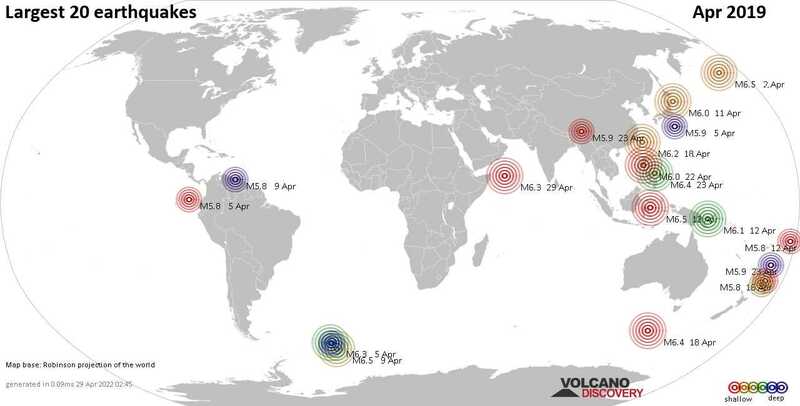 If you are looking for smaller and/or earthquakes in a specific region, you should navigate there from the top menu - otherwise, there would be hundreds or thousands of earthquakes shown here. 78-7070 Ali’i Drive, Kailua-Kona. Keauhou area / MMI II (Very weak shaking): Reclining on a sofa reading a book when there was a shudder and a cracking sound. Similar feeling to the start of the prior 5.2 earthquake. So happy it stopped. Can’t figure out the safest place to go in this three story condo during an earthquake.